Morning clouds dispersed. Four wild gobblers gleaned the cornfield, beyond the hayfield, north of the homestead. A brilliant early afternoon sun cast a short shadow from the great oak. The night before’s fresh snow dripped from the eaves. The cabin grew too warm, the space too confining. “Answer the call, go to the woods,” my wife urged in a knowing tone. I did not argue. The elk center-seams fell beside the stool; wool knee socks cushioned lined winter moccasins. Hunt-stained buckskin leggins, an extra osnaburg trade shirt, a wool shirt and the linen hunting shirt came next, held snug with a woven sash. The wiping stick thumped on the Northwest gun’s breech, to confirm my recollection. The horn and pouch nestled on my right hip. I pulled the knit cap on after closing the back door. The air smelled fresh and damp. A brisk jaunt put me at the edge of the big woods. A proper measure of gunpowder tumbled down the trade gun’s bore. A few steps to the left, I tugged a handful of white oak leaves from a low branch; two fell to the melting snow. I tore three leaves, discarding the damp stem-end in favor of the dry body, stuffed them in the muzzle, then tamped the wadding tight over the powder. Shot rattled; a single leaf held the death bees firm. With my thumb over the horn’s tip, a sprinkling of gunpowder primed the pan. While loading, the historical me took charge and waltzed through time’s portal. It was early February and I found myself standing in the Old Northwest Territory, three hills east of the River Raisin. The year was 1795. My buffalo-hide moccasins whispered south, bent on the crease between the hardwoods and red cedar trees. Fox squirrels or cottontail rabbits, it made no difference; hunger knows no preference. At the second pause a red-tailed hawk circled high above the hardwoods, soaring in majestic splendor against a cloudless, azure sky. I expected a piercing scream, but heard none. Two more steps and my moccasin stomped snow from a juniper. Four sets of rabbit tracks flirted with the ground hugging evergreen; a night’s worth romped here and there on the rolling hillside, mingled with a doe and two spring fawns, a weaving coyote, several turkeys, an opossum, fox and red squirrels and an occasional mouse. Far off, to the south, a crow hollered, “Caw, caw, caw, caw…” Another answered, in the oaks to the north of the nasty thicket. My course zigzagged south, checking all the junipers, a few dead cedars and two oak limbs that rested on the ground. At the east end of Fox Hill, I chose not to test my luck by venturing into the ice-filled sedge grass and elder, fearing the soaking consequences of a mild winter. Standing on the swamp’s cut bank, my eyes tracked a cottontail as it meandered in a graceful loop to the shallow deer crossing, about thirty paces to the northwest. I change my plan and eased toward the a downed oak top that still held dry summer leaves, realizing the various rabbit tracks intersected at that brushy lair. The top half of the young oak lay sprawled next to the frozen swamp. An inner voice suggested care; I felt supper was close at hand. A cold thumb fiddled with the firelock’s hammer. Without thinking, I checked the smoothbore’s precious prime a few footfalls from the tree’s bushy crown. My moccasins crept down the trunk. Near the splintered break, at a fork, a light sprinkling of dirt colored the snow. Dingy, gray ice, packed from coming and going, marked the rabbit’s hole. I sighed, stood and looked to the north; discouraged, but hoping the rabbit was sunning nearby, I returned to working the hillside. As I descended the hillside, fox squirrel tracks crisscrossed cottontail tracks. But all afternoon I spied not a single squirrel in the barren branches overhead. I again found myself in the midst of rabbit runs, all converging on a single thicket, and again I found not one, but two icy holes. In frustration I crested the next hill and came to rest on my blanket roll with my back against a young cedar tree. Several Sandhill cranes winged over the flats, banked, then settled down. “Urrr-ggooou-aaa, Urrr-ggooou-aaa,” they cried. This was the first winter I could remember when the cranes did not fly south. Light snows, open water and an abundance of cornfields seemed to make the migration unnecessary. I sat for longer than I planned on the oak ridge. The afternoon breeze grew colder, and I felt it best to move. In a while I emerged from the big woods and still hunted the border crease between the hardwoods and cedar grove. 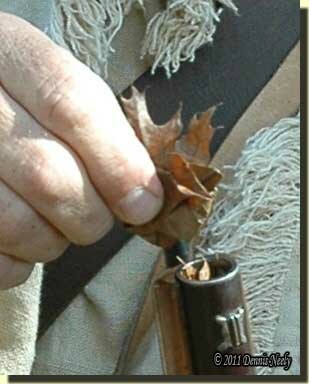 The still-hunt returned to the point of beginning, the little white oak that offered up the Northwest gun’s wadding. A rabbit run headed east, angling in the homestead’s direction. I followed, seeking to amuse myself on the walk home. “Where are you going to find leaves and grass in the dead of winter?” Bill, my passenger, asked the week prior. “All around,” I answered, not trying to appear smug or cocky. 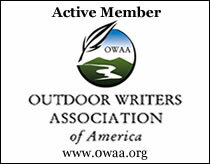 Bill and I discussed a variety of topics on the thirty-five-mile drive to state land for a snowshoe hare hunt, an annual outing for the Michigan Outdoor Writers Association. Just before reaching our preset rendezvous point, the Northwest trade gun and my passion for traditional black powder hunting took center stage. The conversation touched on using natural wadding materials, such as leaves and grass, to load “Old Turkey Feathers,” and that spawned Bill’s question. Natural wadding lessons recur with regularity in my alter ego’s classroom curriculum, and have for the last three or so years. 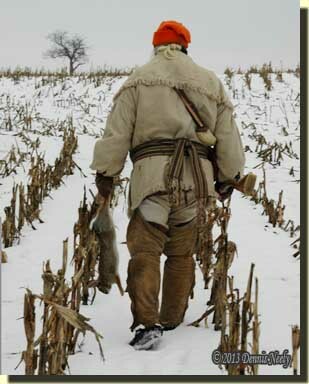 Two winters ago I shared Bill’s concern as I prepared for the MOWA February rabbit hunt near Onekama. Thinking leaves and grass would be non-existent in a pine forest blanketed with snow deep enough to require snowshoes, I tossed some .125 cards in my shot pouch. The lesson plan that day focused on 18th-century snowshoe bindings. Like a good student, I followed the syllabus and chickened out, choosing the modern cards for wadding. The single-thong snowshoe bindings worked with little alteration, which is unusual in the wilderness classroom. In my living history endeavors, failures outnumber successes, learning curves resemble roller coaster tracks, and a smooth bell curve is a rarity. With that in mind, I brought along a second pair of snowshoes with modern leather bindings, in case of a disaster. But on that Saturday, the failure I experienced was not related to the leather bindings. A few strides off the two-track, the thong bindings and the snowshoes became a non-issue. As we swooshed along a little bubbling creek, I spotted dried leaves on scrub oaks and tufts of grass above the snow. Much to my surprise, I could have filled one of John Sayer’s Snake River rum barrels with a season’s worth of natural wadding, dispelling my preconceived notion of availability. The winter moccasins trudged up a small knoll; my intention was to shorten the distance home as night was not far off. At the wagon trail, piled brush, cut to clear the roadway, teased my thoughts. I turned back at the urging of an inner voice that said, “One last try.” My left moccasin pressed on the heap’s outer branches, dry and devoid of foliage. Snow dribbled. Gray fur bounded straight away, veered right, passed behind an oak then reappeared, hind legs over ears. The English flint clicked to attention. The trade gun’s buttstock slammed into an eager shoulder. The muzzle swung in pursuit, hitting a snow-covered cedar bough. Ice crystals showered. White globs clung to the browned barrel as “Old Turkey Feathers” caught the streaking rabbit’s white, bobbing tail, then raced through its flexing body. A yellow tongue of fire belched from the bore. A thunderous roar broke the evening tranquility. The recoil shook the snow from the dropping barrel. With long, slipping strides I arrived at the rabbit. A bit distressed, I realized I had not prayed for “a clean kill, or a clean miss” at any time during the afternoon’s many pursuits. I knelt and thanked God for the blessing of that meal. I expect He understood and knew that hunger knows no preference. 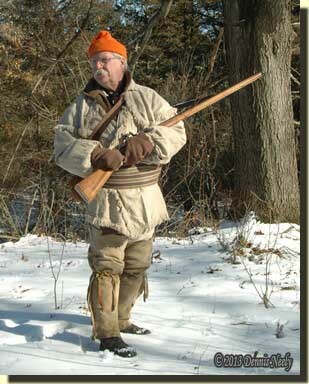 This entry was posted in Rabbit Hunts, Research, Wilderness Classroom and tagged Dennis Neely, historical trekking, North West trade gun, Northwest trade gun, traditional black powder, traditional black powder hunting, traditional blackpowder, traditional blackpowder hunting. Bookmark the permalink. Sadly, our Ohio rabbit season is now over. My 1730 English fowler and I have had a good year though. Quite a few rabbits are now stored away and quite a few more than that are hiding in their lairs laughing at me, i’m sure. On the other hand, the woodchucks will popping up in just a few weeks. It’ll be time to trade the fowler for a 40cal flint rifle. Happy Days. Our squirrel season slipped away from me, and I didn’t realize it–too many commitments and writing projects.